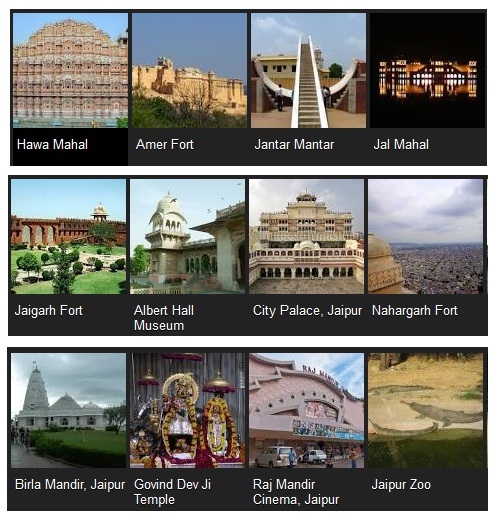 Jaipur (Rajasthan) Tourist Places To Visit. The magnificent state of Rajasthan is the largest state of India in terms of area. Even though it is mostly situated in the Thar Desert, the history and the culture of Rajasthan is anything but dry. Rajasthan literally means the land of kings and its royal lineage is evident everywhere you go. Since Rajasthan has a plethora of ancient forts, museums and other places of interest, to visit them all is quite a daunting task. However when tourists go to Rajasthan they often fail to see the true richness and grandeur of the state, the true culture of Rajasthan because their knowledge is limited by what they learn from mainstream sources, which more often than not highlight a few places as the most important places to visit and neglect the other places of equal if not more significance. Sadly most of the tourists rely on those sources and end up visiting the same places again and again. This is an issue we aim to address through this article. Highlighting all the places of interest in Rajasthan in one article is an exercise in futility, a book shall be a more suitable medium for that endeavour. However in these articles we shall focus on a specific region of Rajasthan and educate you on what that place has to offer, so that the next time you come to Rajasthan, instead of visiting the same old places that every other tourist visits you can make this visit a unique experience by visiting places which are magnificent, beautiful and off the beaten track. This shall benefit you in two ways, firstly you get to visit a side of Rajasthan that an ordinary tourist may never witness and secondly you earn bragging rights for eternity among your friends for your deep knowledge of the area…..however that is until they themselves stumble upon this article. So there is no better way to start the article than to focus on Jaipur also known as the ‘Pink City’ which is the capital of Rajasthan. Jaipur is the largest city in the state and its close proximity to the National Capital Region (NCR) makes it a very popular tourist destination. In this article we shall present to you not only a list of the most interesting places to be found in Jaipur but we shall explain in details the various features of each place and what is it that makes it so special, thereby helping you decide whether that place works for you or not. Amber Fort is also known as the Amer fort. It is located on a hill a few miles away from Jaipur in a small town called Amer, from which the fort takes its name. It is one of the main attractions in Jaipur and has tourists flocking from all over the world to admire the architectural beauty of the fort. Guides are available if you want to know the history of the fort. Elephant rides are available all throughout the day. Visit the Sheesh Mahal or the House of Mirrors and go crazy (not really….but the effect is spectacular) seeing your image reflected in hundreds of mirrors. In India there are 5 Jantar Mantars, however the largest Jantar Mantar is located right here in Jaipur. It contains instruments related to the science of astronomy; these instruments were constructed using the principles taught by the ancient Hindu texts. It also contains the worlds largest stone sundial thus in recognition of its historical importance the United Nations Educational, Scientific and Cultural Organisation (UNESCO) has accorded this Jantar Mantar the tag of a World Heritage Site. If you are a first timer here you would do well to hire a guide, plenty are available for hire and they are quite knowledgeable thus they can explain the intricate workings of the archaic instruments well. If you intend to visit the City Palace too, (which of course you do) then you should know that a combined ticket for both the City Palace & Jantar Mantar can be bought outside Jantar Mantar. The largest sundial is a must see, the accuracy of such a simple device shall have you spellbound. Hawa Mahal is a palace in Jaipur and the feature which sets it apart and also gives the palace its name is a collection of nine hundred and fifty three tiny windows that dot the entire front facade of the palace. The palace was built for the sole reason of allowing the women who belonged to the royal household to watch celebrations and parades on the streets without themselves being seen. The front facade of the Hawa Mahal is shaped as the crown of Lord Krishna. If possible do catch a glimpse of the Hawa Mahal during sunrise; the view is well worth the trouble of rising early. As the name suggests the City Palace is located in the city itself. Do not be mistaken by its name, City Palace is not a single palace but a group of palaces and buildings, the most notable among them being Chandra Mahal and Mubarak Mahal. The most interesting fact about the City Palace is that it still serves as a residence for the erstwhile royal family of Jaipur. A combined ticket of City Palace,Amber Fort and a few other places is available and it comes with the added benefit of being valid for 2 days, thus you do not have to tire yourself out by rushing around trying to cover all the places in one day. Facilities for an audio tour are available. Entrance fee for Chandra Mahal may be a bit steep for some people but it is advisable to visit it once as it gives you a taste of the royal life by allowing you to view their furniture, utensils etc. up close. Jaigarh Fort literally translates as Victory Fort and it overlooks the Amber Fort, in Amer. The fort was built for the protection of Amber fort and most importantly the city of Amer. The fort is located on a hill which is part of the Aravalli range of mountains and is known as the Hill of Eagles. This fort was a military base and is home to a fearsome cannon, which was in its time, the largest of its kind in the whole world. This terrifying machine is supposed to have a mind boggling range of 35 Km. In the rainy season the fort takes on a magical beauty of its own, so if you are anywhere near Jaipur during the monsoons you know where to go. The entrance to the fort is extremely nominally priced and thus giving this a miss is nothing short of a crime. The fort which is located on the Aravalli range, stands overlooking the city of Jaipur. In ancient times this fort together with the Amer Fort and the Jaigarh Fort formed a protective ring around the city of Jaipur to protect it from foreign invaders. The fort is made of yellow sandstone and when the sun’s rays fall on its walls, the fort gleams as if it’s made of gold. It is a popular spot for shooting movies, the most notable among them being ‘Rang de Basanti’. The top of the fort provides an unhindered view of the surrounding areas and it is majestic to say the least. The view is breath taking at all times but if you truly want a magical experience then you would do well to experience a sunset whilst on top of this fort. It is an exquisitely designed step well constructed in the 16th century. In ancient times it served the dual purpose of, being a water conservatory and a community center. It is surprising to see that the place has fallen from the tourist itinerary despite its close proximity to Jaipur. The place is located near Amber Fort and largely remains devoid of huge crowds. However you can be sure to find a few artists in the step well sketching the beautiful architecture on any given day. Another popular spot for movie shootings, the entry here is free. It is the best place to spend a lazy, peaceful afternoon feeding the fishes which populate the wells now. The architecture of the well is unique and compels you to admire its beauty. Jal Mahal as the name suggests is a palace located on water. The Jal Mahal in Jaipur is a palace that was constructed by Maharaja Jai Singh II at the center of the Man Sarovar Lake located in Jaipur. The palace which is unfortunately not open to visitors looks stunning at night when it is lit up in bright lights. With the palace in the center of the lake as a backdrop, it offers unique photo opportunities for tourists. Elephant, camel and horse rides are available; you will be literally spoilt for choice. There is a music and light show in the evenings and in it can only be described as amazing. A cenotaph is a memorial or a tomb constructed in honour of someone. However the critical difference between a tomb and a cenotaph is that a tomb contains the remains of the person it intends to honour while a cenotaph honours a person whose remains are elsewhere. The Royal Gaitor which is located on the outskirts of Jaipur is actually a collection of royal cenotaphs and contains stone structures of breathtaking beauty, which honour the various rulers who ruled Jaipur. The place contains the memorials of rulers of different times and the design of these memorials allows you to view the different architectural styles of the different eras. Not only rulers, but other royals are honored here too. Apart from the obvious historical significance this place is also a favourite amongst those who crave for some solitude and some peace and quiet. This temple is actually dedicated to Lord Krishna, Govind Dev being just one of many names by which he is known. The fact that makes this temple a must see on any tourists itinerary is that the idol of Lord Krishna that can be found in this temple is supposed to be the exact image of him in real life. For those who are spiritually inclined the evening aarti is a must. The temple in spite of its age is extremely well maintained. The premises of the temple are also kept neat and tidy, the efforts of the management clearly visible from the cleanliness on display. Since the idol boasts of being a spitting image of Lord Krishna, it is but inevitable that the idol displays rare beauty and craftsmanship. The Birla temple in Jaipur, also known as the Laxmi Narayan Temple, is a magnificent structure. Located below the Moti Dungari hill, it forms a part of the group of Birla temples that can be found in various places throughout India. The temple is extremely well maintained, with large open places for devotees to relax or rest. The absence of queues is a welcome respite for the tourists. If you have not made up your mind about Moti Dungari yet, this bit of information might change your mind. At the top of the Moti Dungari hill is a beautiful temple dedicated to Lord Ganesha and this idol is allegedly half a millennium old. Thus going to Moti Dungari allows tourists to explore both the temples dedicated to Lord Krishna and Lord Ganesha respectively. This temple is located a few miles away from the main city of Jaipur. This temple has in recent times developed into an important Hindu pilgrimage site, and devotees from all corners of the world can be seen flocking to it. In ancient times the temple served as a place where ascetics came to live after renouncing their material possessions and ties. The temple is made of pink sandstone and is spectacular to look at, to say the least. The famous Monkey temple which was featured in a National Geographic television series is also located here. Contains a holy kund which, as legend has it, has never dried up. Even though the source of its water has never been found. Monkeys are a constant presence in this temple and if you fear monkeys then this could be a deal breaker for you, even though the primates are friendly and comfortable around humans. Water babies take note, bathing in the holy water is allowed, so you can cool off in the summers while purifying your soul too. Devoted to the Sun God this temple has a steady stream of devotees lining up every day. The Surya Mandir is in very close proximity to the Galtaji Temples, and can be easily visited on the way to Galtaji. Any mention of sun temples brings the great temples of Konark to mind, however the Surya Mandir in Jaipur can rival them in terms of its architecture and beauty. It is fitting in a sense to watch the sun set on the horizon, from a temple dedicated to the Sun God, and it truly is a view befitting the Gods. Lord Hanuman who epitomises strength, loyalty and friendship has one of the most famous temples in Rajasthan dedicated to his name. Located at Laxmi Dungri, just off the Delhi-Jaipur bypass this temple is a must visit for any tourist. The temple provides facilities for organising social functions and even birthday parties. In what has been a very welcome addition to the temple, the temple authorities have done well to provide transportation facilities for senior citizens and people who are differently abled. The Akshardham Temple does not boast of an ancient lineage like the others on this list by virtue of being built in relatively modern times. However the lack of history does not take away from the breathtaking beauty that this temple, which is dedicated to Lord Narayana, has to offer. The magnificence of the intricate carvings and stunning sculptures needs to be seen to be believed. The temple compound contains large lawns lush with greenery. There is a spectacular light show which is held daily in the evenings. The security in this temple is pretty tight, and any electronic or metal items have to be surrendered before entering the premises. The tourists can collect them on their way out. The temple located in Amer was built in the 16th century. The temple is dedicated to Lord Krishna and his devotee Meera Bai. The idol in the temple is, according to local folklore, the same idol that Meera Bai used to worship. The temple holds the distinction of being the only temple in the world which is dedicated to both Lord Krishna and Meera Bai. The temple boasts of an architectural style which is not limited to a single school of thought, rather it is a fusion of various styles, mainly the Hindu, Jain and Mughal architectural styles. Sanganer is a town located 16 km away from Jaipur, it is a place of religious importance for Jains as it contains an ancient Jain Temple. This temple is dedicated to the first tirthankara Lord Adinath. The temple is made of red sandstone and features intricate carvings dating back to the 10th century. The temple is a place of mystery and intrigue as it is fabled to have chambers deep underground as deep as seven floors and those are forbidden to anyone but saints. On account of being a Jain temple, tourists are required to remove all leather items before entering its premises. Even here taking photographs is strictly forbidden, thus shutterbugs would do well to make it a rule and pay heed to the warning signs or ask the people in charge before they start clicking away to glory in any of the monuments that they visit. For a very nominal charge you can enjoy authentic Jain food here. Since this temple is an important pilgrimage site for Jains, they provide facilities for overnight stay to visiting Jains. This museum is the State museum of Rajasthan in addition to also being the largest museum in Rajasthan, and as is befitting a museum of this stature it boasts of an enviable collection of items, belonging to different eras, which have been sourced from locations, all around the world. The museum is immense, and boasts of a collection which is as diverse as it is vast. The museum provides tourists with facilities for an audio guide, should they require one. Owing to the size of the museum it is advisable to visit it with some time on hand, to truly explore the treasures contained in it. The importance of this museum can be gauged from the fact that in India there are only 6 museums which can boast of having authentic Egyptian mummies on display, and the Albert Hall Museum in Jaipur is one of them. The SRC stands for Shri Ram Charan, and the museum contains items which are essentially the private collection of a scholar of the same name, i.e. Ram Charan. The sheer variety of the items contained ranging from manuscripts to sculptures to paintings to even ‘tantric’ items make this museum a must visit. It can safely be said that the things that can be seen in this museum cannot be seen anywhere else. If you crave a unique experience, then this museum is your best bet, with items ranging from the mundane to the bizarre, and all of them belonging to an era gone by. Located in the shadow of the Amber fort, the Anokhi Museum of Hand Printing is a beautiful museum which aims to educate the people in the dying art of hand printing. With rapid commercialisation, techniques like hand printing are dying out and the museum hopes to revive the glorious past of this dying art. This is not a museum in the conventional sense; there are block printers here, who will show you live how the printing is done. Central Park as can be understood by the name; is located in the center of Jaipur. The park has been developed by the development authority of Jaipur and is a modern park with all the modern facilities and amenities associated with that tag. This includes a jogging track that measures about 5 kilometres in length, and a golf and polo club too. The biggest draw of this park is obviously its jogging track. However this park also boasts of the tallest Indian National Flag in the country. It is a great feeling watching our tri colour towering more than 200 ft above us, fluttering majestically in the wind. Due to the ample open space available, music and dance concerts are often held within the park, and if you are in luck you might get to watch on of them. Do remember to check with locals or the local newspaper for any upcoming events in this park. The park is the resting ground for various migratory birds, which come from all over the world. In another big plus, this park also provides free Wi-Fi to its visitors. The Sisodia Rani Garden is not just a garden; it throws in a palace too for good measure. Jokes apart, the garden is located just about 4 miles from Jaipur. The unique feature about this garden is that it contains gardens at multiple levels which are divided into tiers. There are water features interspersed throughout the garden adding to its beauty. The palace itself is an object of beauty containing many galleries and murals. The palace boasts of murals and paintings depicting Lord Krishna and Radha, in scenes taken from their stories. The place is a cupid’s playground and a favourite among the more romantically inclined. The Man Sagar Lake is a lake situated in Jaipur. Its claim to fame is that it is a manmade lake and that the Jal Mahal, which has already been mentioned above, is situated on this lake. The Jal Mahal is located on this lake, thus all the reasons listed for visiting Jal Mahal also apply here. The Kala Kendra is a stage for budding artists to showcase their talent, it boasts of all the modern amenities like auditoriums, libraries, galleries etc. of a modern art center. Exhibitions of paintings, photographs, sculptures etc. are an ongoing affair here. Fairs celebrating Rajasthani arts and crafts are also held regularly. Thus it can safely be said that this place is the nerve center for any acticities remotely related to art including the performing arts. The Jaipur Zoo is every child’s delight. That being said even adults enjoy an excursion to the zoo. This zoo contains over 500 birds and animals, belonging to over 50 different species. It is also home to India’s 4th largest gharial breeding farm. The wide variety of animals, birds and reptiles make it a delight for children and wildlife lovers. The zoo boasts of exotic animals like white tigers, hyenas, wolves etc. The entrance fee for Indian citizens is very nominal, though foreigners have to pay a bit more; there is also an additional charge on cameras. However with the advent of camera phones, the benefit of this rule is debatable.